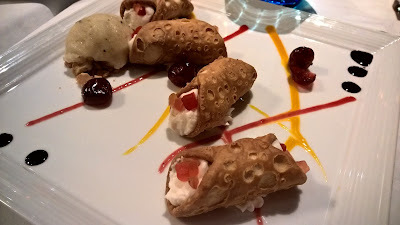 There are some noteworthy high end Italian restaurants in Abu Dhabi. Each one proclaims to offer something unique, while some succeed more than others in delivering on that philosophy. When I heard about Circo (pronounced Cherko) opening at the Intercontinental in Abu Dhabi, I was naturally intrigued. After all, every restaurant needs an angle, a gimmick or an x factor. That was in November. 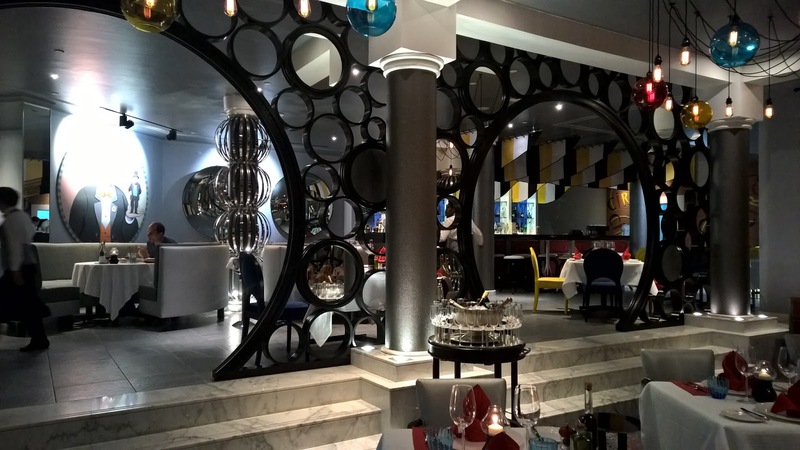 Now 6 months on, and a favourite with the readers of Tripadvisor, it was time for me to see how it fitted into the Italian dining landscape of Abu Dhabi. It is colourful. Reds, whites, blues and yellows make their way around the restaurant. But this is no kids party. Of course by now you have heard about the circus or carnival theme, but it is exquisitely tasteful. Floor to ceiling windows on one side allow natural light to filter into an already happy and cheerful restaurant. Again though, I need to emphasise how elegantly it is all put together. 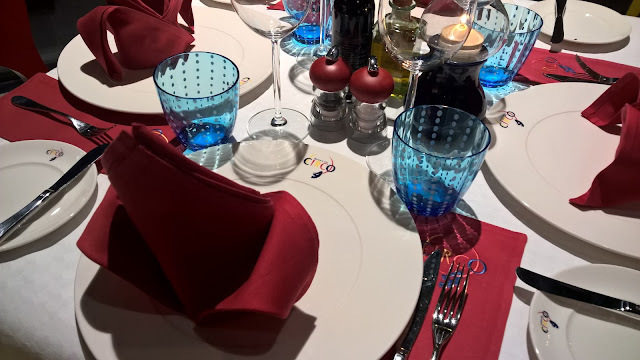 Notwithstanding the lively colours, there is nothing gaudy or ostentatious about Circo. There is nothing over the top about an atmosphere that strikes me as joyful. And that is before I have even looked at the menu. 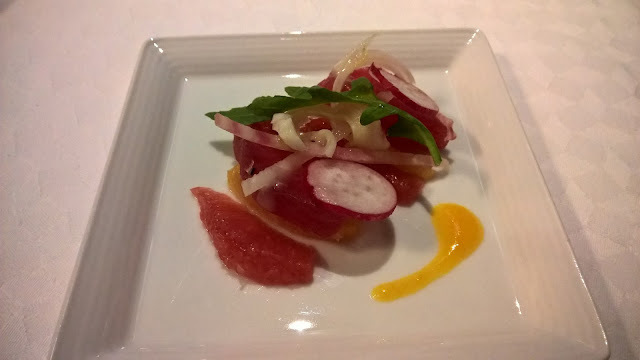 We start off with an amuse bouche of Crudo di Tonno con Agrumi which is a tuna crudo (no, it is not sashimi) with so much else on the plate that I feel I am at a concert celebrating the arrival of Summer. It is only the amuse bouche and already I am taken in - fennel, radish are on their own quite challenging flavours for immature tongues, but kumquat marmalade brings a lovely sweetness to the fore. In addition, there is the tang of the grapefruit offset by the sweet of an orange. A potent start to the evening. Regretfully, I have the Valdo Prosecco which does not rise to the occasion. 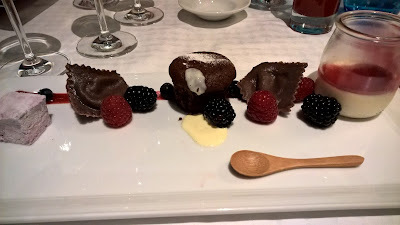 My first choice was the excellent Nino Franco Prosecco Rustico, but I knew I also wanted the wine pairing option recommended by restaurant manager Gianlucca, so I opted for the latter. Next time . 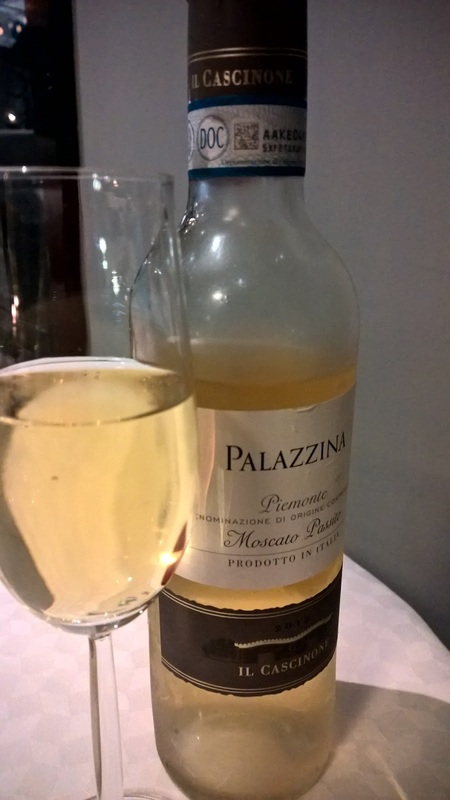 Thankfully, not long after, I am offered a 2014 Banfi Principessa Gavia Gavi, a fresh, dry and light wine offering balance. It is served with a variation of a menu item. Usually the Salmon all Piastra is served with stewed Brussel sprouts, roasted cauliflower and celery root purée. Instead, tonight it is scallops. I am elated! What a great dish. Firstly, it looks really rustic, confirming the homely influence on Circo brought by Egidiana Maccioni, the female force behind her husband and sons who brought Circo to the capital. It is this dish for me that so early on in my course conveys the restaurant's ethos of hearty Italian food in a luxe setting. 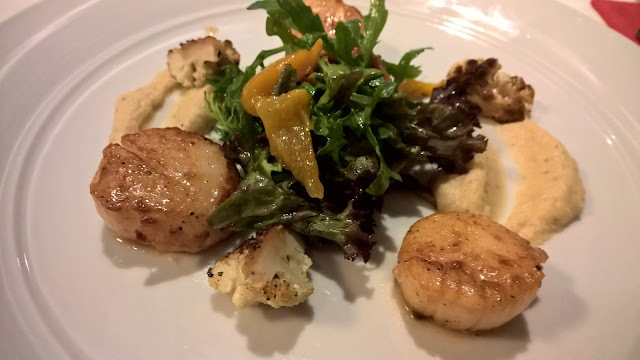 Delicately coated in vinaigrette, the salad is flavoured so that it does not usurp the scallops. Having said that, it is the salad that holds the dish together, or else the delicate sweetness of the grilled pepper, to a lesser extent the scallops and of course the more pronounced sweetness in the celery purée could create a one sided dish. Of course the texture of the cauliflower cannot be overlooked, nor could the perfectly cooked scallops. Circo 2 - My expectations 0! There is no let up at this stage as Chef Matteo, ( Chef Luca is away at the moment) a Milanese native who at this point has surprised me with the balance and depth of his cooking, belying his youthfulness. At 25, he has an exciting future ahead. 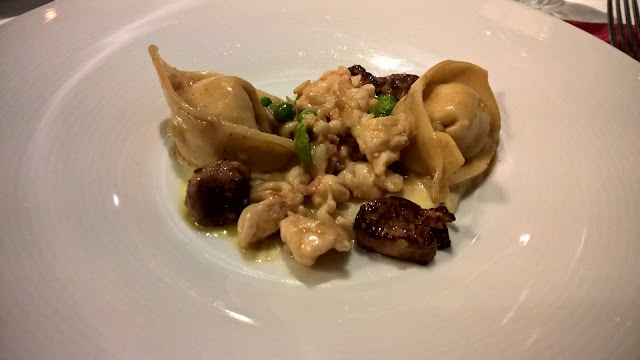 He presents the Cappellacci all' Astice con Foie Gras or the Lobster Tortelli with seared foie gras. The first thought that makes it way into my head is the heartiness of the meal. And so earthy too. Peas. What a beautiful choice to add a bit of colour. And the sauce - oh the sauce. I reach for a piece of bread and dip it in the sauce. Mmmmm. I still think it is one of the most under appreciated vegetables. Chef uses foie gras very delicately, with three tiny pieces on the plate. How easy it would have been to be excessive and use large pieces, especially in a dining culture where some restaurants still believe that more is more. Restraint in a mature chef is expected. In a young chef it is admirable. It is at this time that the restaurant's entertainment really gets going. The Dolce Vita Duo, Eduardo and Simonetta, a pianist/violinist and vocalist seem to have been doing this forever, belting out anything from traditional Italian to more adult contemporary Italian tunes. As I listen to them, I can imagine myself telling friends the next day that I took in dinner and a show. That is how it feels. They are a perfect match for this venue. More than an x factor, a wow factor. Meanwhile, my waiter has switched my wine to the 2013 Attems Pinot Grigio, the ideal Summer wine. Just right for the Abu Dhabi climate this time of year. You cannot go wrong with a Pinot Grigio and seafood. Quintessentially Italian. My delightful seafood journey continues as the Branzino, Cozze e Cannolicchi in Crema di Zafferano is served. 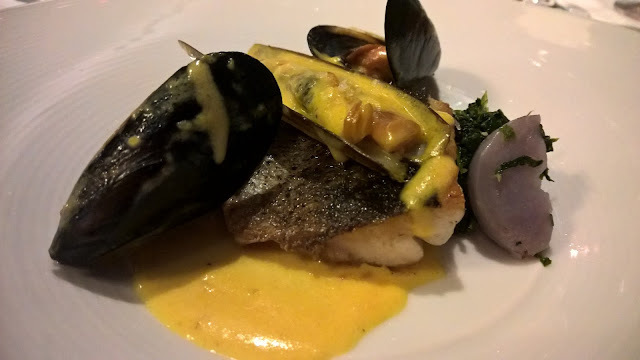 It is a pan seared Mediterranean sea bass, razor clams and mussels served in saffron sauce. This is a departure from the previous two dishes, with chef abandoning any thoughts of conservatism as he, to varying degrees, swathes the sea bass, mussels and clams in an ebullient saffron sauce. Colour! But cleverly the sea bass' skin is untouched, allowing its lightly salted skin to be enjoyed unspoiled. Added texture comes courtesy of the spinach and sundried tomatoes. Just before my meat course is to be served, I notice the restaurant manager, Gianluca Maglianella, visiting a table for the second time that night. He does this with a verve and naturalness that I have not seen in many high end restaurants. Furthermore, having had the pleasure of meeting him earlier, I wonder what story he is telling them at that table. Food has stories to tell, according to him. To me he is a powerful reminder of a restaurant's most valuable resource - its staff! 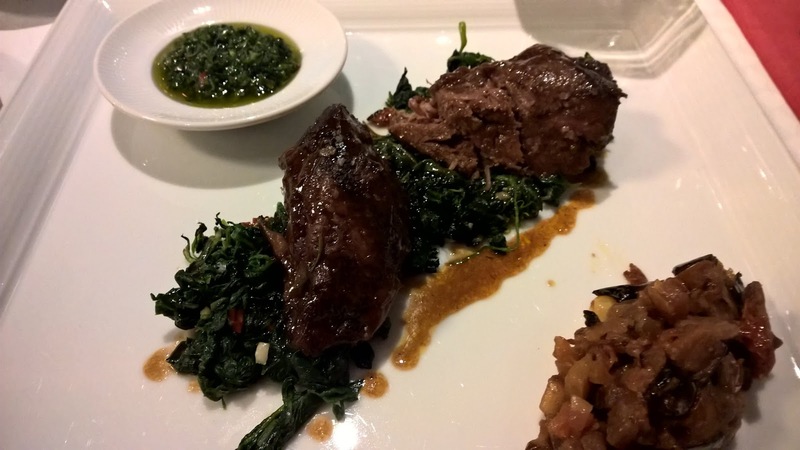 For my my meat course, Chef ventures off the menu to serve up a classic - Veal cheek. It is served on a bed of spinach, while on the plate there is also vegetable caponata. but for this dish, I cannot look beyond the veal. All the clichés you have heard about veal come to my mind. It vies for dish of the day, along with the Scallops and Lobster tortelli. 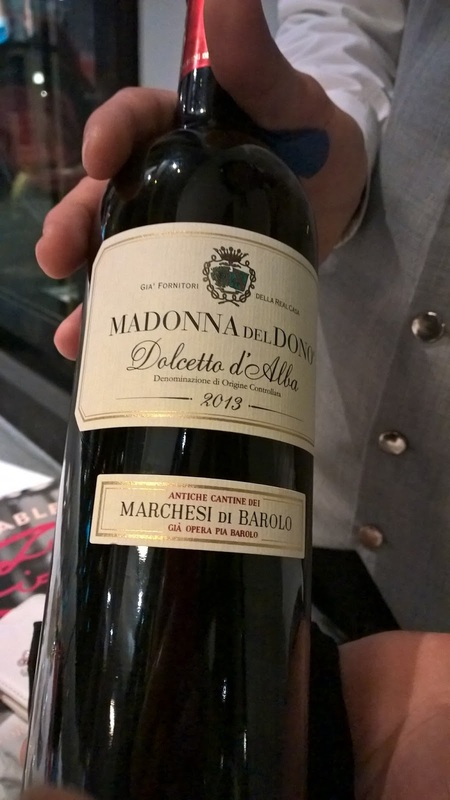 Accompanying my dish is a 2013 Madonna del Dono Dolcetto D'Alba. This deep red Northern Italian wine is full and goes down really smoothly, almost velvet like. A good match for the veal. Finally, dessert marks a shift for me. Tiramisu is of course to an Italian restaurant what breathing is to life, but Chef serves us the Cannoli Siciliani, which is filled with ricotta cream, candied Fruit, Prosecco Truffle Sorbet. It is a delightful dessert, playfully presented. It has been a while since I have had something akin to glazed cherries. We also have the Zuccotto al Miele, a traditional Tuscan frozen cake with honey, Italian meringue, strawberry gel and dried raspberry. My favourite of the two as it is a classic sweet sour dessert. 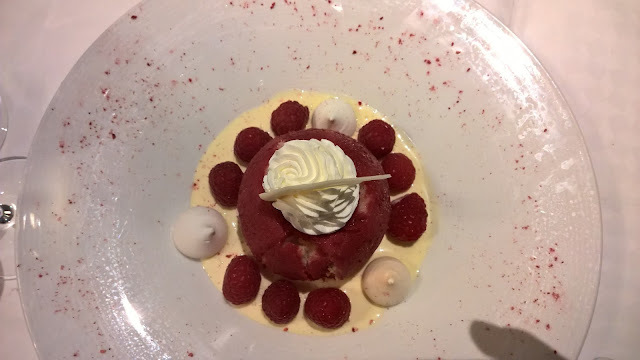 The raspberries provide the perfect foil for the sweetness of the sauce, while the the meringue adds a bit of gentle crunch. But it is the centre that surprises. I say no more. On the other hand, my daughter indulges in the Fantasia al Cioccolato Valrhona or Chocolate Fantasy. Although Chef has used dark chocolate, she loves it, especially the chocolate ravioli. Chef has shown himself to be as adept at his desserts as he is at his savoury dishes. With dessert I have a glass of the Palazzina Moscato Passito, a classic sweet dessert wine, bringing to a close what has been a carnival of sights and tastes. As dinner ended, a couple of reflections stayed with me. Firstly, the passion of the restaurant manager as he revealed a colourful narrative tapestry of anecdotes related to the restaurant. A restaurant is more, much more than food, so when I meet someone at the helm of a restaurant who genuinely believes that, I am inspired. Furthermore, I mentioned the youthfulness and maturity at the same time possessed by Chef which manifested itself in his dishes. Also, a waiter who knew his way around guests and brought home emphatically the notion that dishes and fine ingredients are important, but so are staff. Circo 5 - My expectations 0. 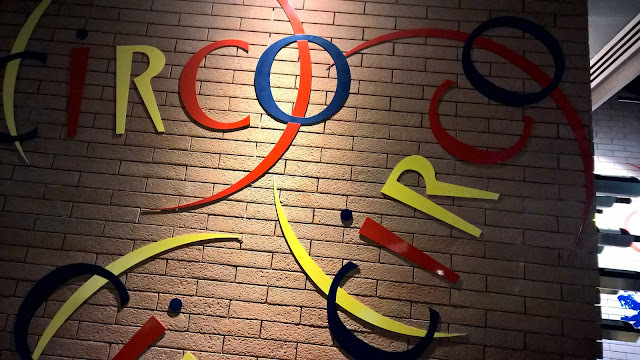 Circo brings something fresh to Italian dining in Abu Dhabi. It is a restaurant that offers the guest a consummate experience, something many restaurants claim to do but fail to deliver.